Banana cake recipes come in many versions. They can be made sugarless and with a variety of different ingredients. Some might include milk, buttermilk or sour cream. Some are made with butter, solid shortening or cooking oil. Whatever other ingredients are used, banana cake recipes usually turn out delicious for the sheer fact that ripe bananas add flavor and moistness to the cakes. Sometimes when you buy bananas the only ones available are solid green. Since these just don’t add much flavor it is good to know how to ripen bananas rather than leaving them on the counter and waiting for many days for them to ripen naturally. Place the bananas in a paper bag and close the bag. The gases produced by the ripening process will help the bananas to ripen quicker. You could also add a ripe apple or tomato in the bag with the bananas to help speed up the process. Some cake recipes are called one bowl cakes because all ingredients are put together in one bowl; banana cake recipes are no exception. These are quick and easy recipes to put together like the following one. 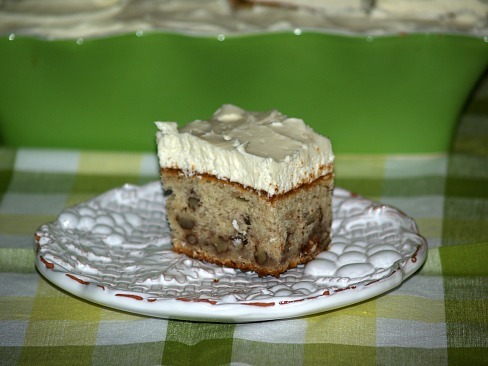 Supposedly of all banana cake recipes this one was the favorite of Elvis Presley. I am not sure of this but I can tell you this one is delicious. Preheat oven to 350F degrees; grease and flour 9X13 inch baking pan. Measure flour and sift; measure flour again and sift together with baking powder and soda. In mixing bowl beat cream cheese until creamy; beat in butter and sugar. Add eggs one at a time beating well after each; beat in bananas. Add flour mixture and milk to the creamed mixture; mix until blended. Fold in black walnuts; dump batter into prepared pan and bake for 1 hour. Combine all ingredients and beat with mixer until whipped. Grease and flour 2 eight inch cake pans. Sift flour, baking powder, baking soda, salt and sugar in a large mixing bowl. Add shortening, bananas and vanilla; mix just until blended. Add eggs and buttermilk and beat for 2 to 3 minutes longer. Pour batter evenly into prepared pans; bake about 30 minutes or until a pick comes out clean. After cooling 10 minutes remove cakes from pans; cool completely. Put cake layers together with sweetened whipped cream or favorite icing. The following is a sugarless cake recipe. With the addition of bananas it has a natural moistness and flavor. It can be sweetened with sugar, a sugar substitute or corn syrup. Grease and lightly flour 9 X 13 inch baking pan. 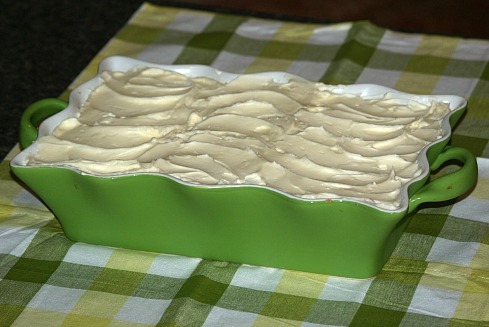 Cream butter with sugar substitute or corn syrup and egg. Combine and mix milk with bananas. Sift flour, baking powder and salt; add dry ingredients to butter mixture alternately with milk and banana mixture. Pour batter into prepared pan and bake for 25 to 30 minutes or until pick comes out clean. Most banana cake recipes are so moist that they don’t require a frosting to be good but this one does include a frosting recipe. It also is a variation from other banana cake recipes by using whole wheat flour. Cream butter and sugar together; add eggs and bananas and beat until well blended. Sift together the all purpose flour, baking soda and baking powder; stir in the whole wheat flour and nuts. Add the dry ingredients alternately with the buttermilk to the creamed mixture; slowly beat until blended. Pour into prepared baking pan and bake about 30 minutes or until pick comes out clean. Remove from oven, cool completely and frost. Combine in a saucepan brown sugar, butter and cream; bring to a boil and boil 1 minute. Beat in powdered sugar and frost cake immediately. Preheat oven to 350F degrees; grease and lightly flour13X9 inch cake baking pan. Cream shortening and sugar; add eggs beating until light and fluffy. Beat in bananas, lemon juice and milk. Add dry ingredients to banana mixture mixing until blended; pour batter into prepared pan. Bake about 30 to 40 minutes or until pick comes out clean.